The death of St. Elizabeth the Grand Duchess and New Martyr tells us about how she lived her life lived long before her martyrdom. Relationships develop through knowledge. As we take the time and the care to learn more about another person, we deepen our relationship with him or her. Let’s spend a few minutes with St. Elizabeth the Grand Duchess and New Martyr, born February 24, 1864; died July 18, 1918. But not just with her life. In fact, how she died tells us what we need to know about how she lived. As Orthodox Christians in a non-Orthodox culture, we have questions: Who are we? What is "the Church"? What is our relationship to friends and family of other faiths? What is ecumenism? Who will be saved? 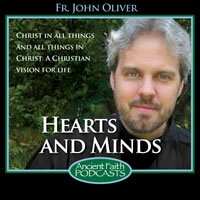 In this special edition of Hearts and Minds, Fr John Oliver offers a few reflections. "Life is full of small opportunities to baptize these inevitable daily pains in the mystery of the cross." "A 'thank you' toward Heaven is nice, but how much more does it mean when it flows from sincerity—from a changing life? The human being says 'thank you' to God by becoming more like him." Here is a charming bit of internet philosophy. The three most important words are: I love you.The two most important words are: Thank you.The one most important word is: Sorry. We’ll come back to that in a while. "This is how the Church address politics every Sunday. Not by endorsing or opposing candidates, but by dealing with the spiritual roots of all the issues that affect all citizens. We locate the heart, then work our way out from there." I have often wondered what becomes of the writer who runs out of words, or what becomes of the podcaster who runs out of voice. Now I know. I’ve struggled with mine for almost a month now, which explains your delicious reprieve from Hearts and Minds. But I think the voice is back, so once again the listeners of Ancient Faith Radio must endure. The struggle is what we bring to God, only what we bring, because deliverance his His job. An old proverbs says, "When you light a torch for another, you illumine your own path too." Why work on ridding ourselves of excuses in this life? So we won't face the consequences of our excuses in the next. "It's not the size of the crumb that turns it into a miracle; it's whether we can see it as a miracle at all."